"If the most common question I get asked is, 'How do I run a fast marathon?,' the 2nd, 3rd, 4th, 5th ... most common questions have something to do with diet, running form, sleep, footwear, stretching, weights; anything but actual running. American runners seem to have an unending fascination with all these extra-curricular activities, yet we continue to get slower at running marathons ... If you want to improve your performance in the marathon, stop worrying about minimalist shoes, caveman diets, and new-age running form, and start worrying about getting out the door and running a little more than you did last week. High mileage works!" - American marathoner Pete Gilmore telling the truth. Show Luke Puskedrsa some love, he earned it!! Dave Smith's "Smith Plan" not so bad. Did the "Oregon Plan" ruin their chances of a top 3 finish? Galen Rupp Vs. Alan Webb At 2010 Applied Materials Silicon Valley Turkey Trot What a surprise matchup which was only announced Wednesday. $10,000 for an AR. *Blanka VlaÅ¡iÄ‡ And David Rudisha Win IAAF Athlete Of The Year Awards *IAAF Release Additionally, both athletes will receive $100,000 despite the IAAF's financial situation. Kara Goucher To End Maternity Leave At Rock 'N' Roll Half On Jan. 16th That's less than four months after giving birth, for those of you asking. Clearly, she's not following the Paula Radcliffe "take it slow" approach. 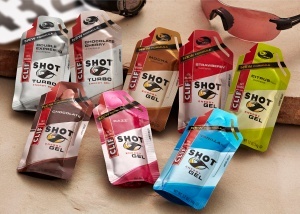 Paula Radcliffe To Only Run One Marathon In 2011 She'll skip London in the spring as she wants to come back slowly to make sure she's ready for 2012. 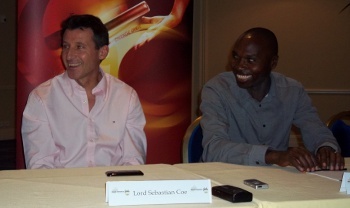 Bernard Lagat & Meseret Defar & Others Meet With Media In Monaco Both say they'll only run the 5k at 2011 Worlds. Q&A With USATF Hall Of Famer Dyrol Burleson, Who Was The 1st To Break 4:00 At Hayward Field He was the world-ranked #1 in 1961. LRC The Week That Was We keep things brief as we talk about lowering expectatons for Haile's comeback and give props to Tulsa, Toledo and Richmond and Megan Venables and the great state of NJ. HS Star Megan Venables Pumped To Have Broken 27-Year-Old Holmdel Record Almost equally as impressive is the fact that she won by 1:40. Shalane Flanagan Raising The Bar For US Marathoners The article points out that sub-2:26 has happened roughly 400 times and the US only has seven of them so we have a long way to go. Our stats reveal that 153 different people (and just 3 Americans) have gone 2:25 or better. US Feds Meet With French Feds On Tuesday To Talk About Armstrong If he's guilty, we hope jail is where he ends up. Despite Protests, Olympic Marathon Almost Certainly To End In London Mall Meanwhile, we wonder if anyone thought about trying to recreate the marathon course that gave us the 26.2 mile distance from 1908. Profile On Mercy Cherono As She Enters Senior Ranks The emergence of the Kenyan women on the track over the last 3 years has been one of the big largely unreported stories in the sport. Recommended Read Former Kansas Great And World 1,500 Record Holder Wes Santee Dies The NY Times Frank Litsky recaps Santee's career and life in great detail. He was America's best hope to be the first sub-4 guy in history. Want to know more about Santee? He was featured in The Perfect Mile. Lots Of HS State Meet Recaps Here Highlights included the F-M girls putting 15 on NY state once again and Megan Venables breaking the Holmdel course record. Juniors Step Up In Kenya: World XC Junior Champ Mercy Cherono Wins Senior Race In Kenya On the men's side, world junior 5,000 silver medallist John Chepkwony won the senior race. Lisa Koll Is Really Enjoying Her New Life With Nike Group In Portland She's upped her training and is apparently fitting in very well with her new teammates, who all decided to vacation in Hawaii. After 2 Disastrous Years, Olympic Champion Pamela Jelimo Ready To Start Comeback At Age Of 21 She says injuries are what have kept her down and will begin her comeback with some XC races. Recommended Read: The Telegraph: Ethiopia needs you Haile Gebrselassie, so does the London 2012 Olympics We loved this quote: "His smile makes athletics smile." All 50 European Federations Vow To Support And Send Stars To 2012 Europeans The idea to have Euros every two years is stupid but not as dumb as putting it right before the Olympics. Unbelievable Simon Bairu Collapsed At Mile 23 And Then The Ambulance He Was In Ran Into A Taxi And He Had To Get Into Another One You'd expect that to happen in a third world country, not New York. Now he'll enjoy some R&R in Hawaii. Mara Yamauchi's Confidence Is Down, But She Vows: "My best isn't behind me." Preview Of 2nd IAAF XC Meet World XC silver medallist Teklemariam Medhin headlines. Last week he beat Ebuya in Spain. Jos Hermens, Haile's Agent, Says Gebrselassie Reconsidering Retirement Hopefully the Great One realizes his fans would love nothing more to see him compete again - New York 2011 and the Olympics in 2012. We didn't realize how much worse the sport will be without Geb until he said he was leaving. LRC Haile Gebrselassie Retirement Update The greatest of all time may be reconsidering. He at least is leaving open the door to coming back. We give you an update on all that we've learned since our last update on Sunday night. More NYC : WSJ Looks At Changing The NYC Marathon Course The current course seems great to us and has a better finish than the proposed course (and pros generally choose marathons for the money, not the type of course). Paula Radcliffe In The News: Radcliffe's Baby Boy Nearly Died While She Gave Birth He came out grey as the umbilical cord was wrapped around his neck and Radcliffe had to push him out quickly. Radcliffe also says she has a "really, really good feeling" about 2012. High School: Meet Last Year's Nike XC Runner-Up Elias Gedyon Originally from Ethiopia, the dude split a 48.6 after winning the 1,600 and 3,200 in a meet last spring. He'll be going for his third straight CA state title in the near future and then heading to Nike (why not Foot Locker?). LRC Men: In Debut, Gebremariam Makes Marathon Look Easy On a day that Father Time caught up to Haile G, another Geb, Gebre Gebremariam blitzed a 26th mile in 4:37 and took us back to an era when debutantes won and road racers won Falmouth and NYC in the same year, as a new marathon star may have emerged on the streets of NY. Meb Keflezighi finished 6th and Dathan Ritzenhein 8th. LRC Women: Edna Kiplagat Completes Magical Year, Shalane Impresses The women's race was perhaps the craziest one ever in New York, as it was a 20-mile jog and a 10k race. LA Marathon champ Edna Kiplagat, American star Shalane Flanagan and half marathon ace Mary Keitany battled over the final miles, with Kiplagat winning and Flanagan battling back for second in her debut. The top 10 were separated by an amazingly small 1:35. *American 10k Record Holder Chris Solinsky Gets Wined & Dined In Elite Truck & Says "Maybe In 3 Years"
Leonard Patrick Komon Smashes 15km World Record He took 16 seconds off the old record by running 41:13, which is 27:28 10,000 pace. Video: Old Record Holder Felix Lim Interviews New Record Holder Komon. 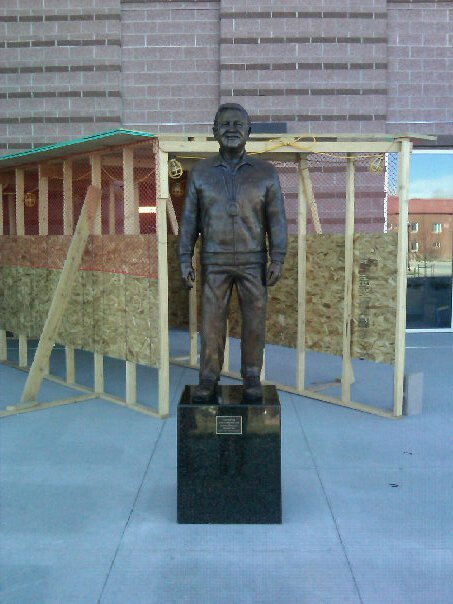 Joe Vigil Honored With Statue At Adams State He may be most known for coaching Deena Kastor, but having his team go 1,2,3,4,5 at the DII NCAA XC champs is simply amazing (and lucky). 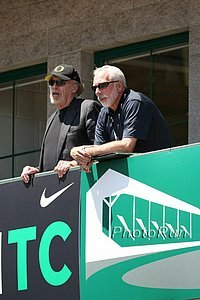 Vin Lananna Talks About NCAA Meet For Men & Women (Video Interview) "With cross country, it's almost impossible to pick (the individual winner)." Forget About NCAAs - The Nationals Milk Mile Is Sunday This event is for runners and spectators. More info at the link above and here. We're sure some of you wish this was a beer mile. If you like beer miles, you'll certainly like this race: 7-Beer, 6-Mile Race in Canada is featured in Edmonton Journal. Anyone remember when Princeton had its 6-pack, 5-miler? Sergey Bubka Demands Olympic 2012 Track Remain A Track "We shook hands and had a deal. In 2005, it was guaranteed to us the track would stay - this is a matter of dignity." LRC Update Former Imprisoned Ethiopian Journalist Says Hermens'/Gebrselassie's Leak And Then Denial Of NY Times Report Is Part Of Attempt To Raise Awareness Of Geb's Plight In Ethiopia, Where He's Had A Lease To Land Worth At Least $7.2 Million Taken By The Government The story talks about the land being worth between 120,000,000 and 150,000,000 birr, which converts to $7.2 and $9.1 million US dollars. Gebrselassie Says He's Still Planning To Run Tokyo Marathon In February Geb's team is now smartly trying to change the topic of conversation. We'll hopefully have an update tomorrow on some of the emails we've received on the news below. LRC Update The NY Times Stands Firm: "The New York Times stands by its story." Plus we have commentary from an Ethiopian political expert who says making Geb and Hermens deny the story is typical of the government. Marion Jones: Clearly Still Lying MJ practically perjured herself last week on Comedy Central and people are outraged. Fukuoka Field Announced Jaouad Gharib & Kebede Tekeste will headline in December. Fasil Bizuneh and Andrew Lemoncello will race as well. LRC Tributes Pour In For The Great Haile Gebrselassie Last week, the world was shocked as the great Haile Gebrselassie retired. The retirement was short-lived but our inbox was flooded with tributes to the great Haile. We share some of them with you, including one from a man who calls Haile an inspiration for millions, another who admits he cried when he watched Haile retire and painted a picture of Haile in victory in Berlin, and lastly a note from a college sophomore in the US who found it easy to be inspired by Haile but hard to be inspired by US stars like Prefontaine, whom he calls an "alcoholic frat boy who refused to listen to anyone" or drug cheats like Alex Rodriguez and Marion Jones or others who have "sexually harassed women (Brett Favre, Kobe Bryant, Ben Roethlisberger)" or "abandoned his family or fans (Tiger Woods, LeBron James)." This Weekend's Mara Marathon Costs $35 (2,500 Shillings) And Includes Night Accommodations Don't let some of the race directors in the US find out or they'll charge a lot more. 1. "Legends of any sport do not retire; instead, they fade off the stage graciously and continue working in the disciplines they know best." 2. "Gebrselassie has done everything in the sport except win a marathon with stiff competition." 3. "Deep down, when he is all alone sitting by the fire, Haile must realise he dropped one of the biggest clangers of his running career." Allyson Felix And David Oliver Win Jesse Owens Award The award goes to the top US track and field athlete each year. Allyson Felix Talks About Doing A Commercial Shoot With Kobe And Talks About Her Off-Season We forgot Felix switched to Nike last year from adidas and we even forgot Kobe hasn't been with adidas for nearly a decade. Haile G's Back!!! Everyone can relax, as the retirement lasted all of one week. Additionally, more good news was revealed as his coach thinks he can compete until he's 45. Can anyone say 2016 Rio? Video story in Armharic here (updated with translation from an LRC visitor). Bizarre: Jim Thorpe's Son Suing Jim Thorpe, PA To Get His Body Back They changed the name of their town for him and should keep it. That's the headline, but the name of the game is qualifying and it looks like the only ranked teams to miss the show are #18 UNC (who totally bombed, as their top runner was only 37th and they only finished 9th in their region) and #26 Tulsa. The non-ranked teams making the show are Gtown, Texas and newcomer Richmond.